Landscape painting in oil became steadily more popular throughout the 19th century. John Constable and J.M.W. Turner take credit for establishing landscape as a suitable theme for painting. Until then history paintings had been considered more important, but increasingly naturalistic oil paintings of picturesque views of the British landscape appealed to a wider section of the art-buying public. 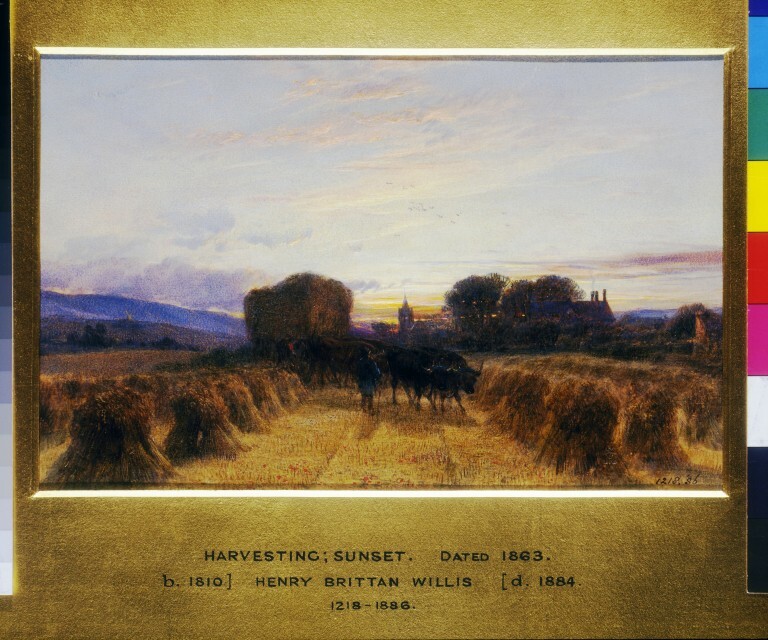 Henry Brittan Willis (1810-1884) was the son of a Bristol painter and was instructed by his father. He went to America in 1842 but returned and settled in London in 1843. He exhibited from 1844 to 1883, mainly at the Old Watercolour Society, but also at the Royal Academy, the British Institution and elsewhere. Willis seems to have specialised in landscapes, often with cattle and wagons, as here. This picture of the harvest on the South Downs is typical of his work. Watercolour entitled 'Harvest Field, with a Bullock Waggon : Sunset'. 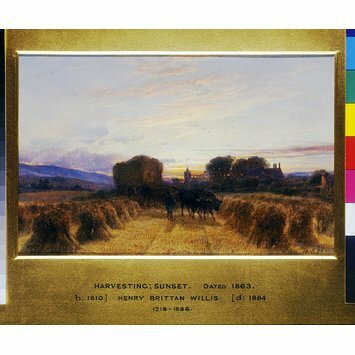 Watercolour by Henry Brittan Willis entitled 'Harvest Field, with a Bullock Waggon : Sunset'. Great Britain, 1863.